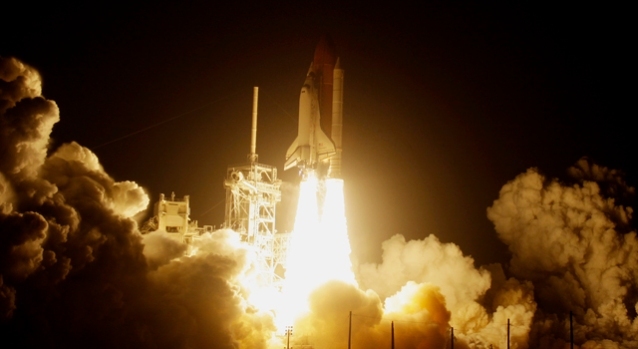 Space Shuttle Discovery lifts off of launch pad 39-a on mission STS-119 on March 15, 2009 in Cape Canaveral, Florida. CAPE CANAVERAL, Fla. – Space shuttle Discovery and its crew of seven rocketed into orbit Sunday evening, setting off on a space station construction mission cut short by launch delays that dragged on for more than a month. The launch, though late, turned out to be flawless and the prettiest NASA managers had ever seen. Discovery rose from its seaside pad just as the sun was setting, an especially spectacular sight for a space agency anxious to get the flight going. As the shuttle sped away like a brilliant star, the upper part of the launch plume glowed pink, peach and golden. Launch controllers could see the shuttle for seven minutes, until it reached somewhere off the New York or New Jersey coast. "We were all rewarded with a beautiful, beautiful launch," said launch director Mike Leinbach. A hydrogen leak prevented Discovery from lifting off Wednesday and, before that, hydrogen valves kept the shuttle grounded for weeks in February. Launch pad repairs took care of the leak, and the astronauts were able to board their spaceship and lift off. "Well, you had a little bit of a wait but that will just make the payoff that much sweeter," Leinbach told the astronauts. Commander Lee Archambault and his crew, which includes two former schoolteachers, should reach the international space station Tuesday. They're delivering one last set of solar wings for the orbiting outpost and some critical equipment for a relatively new water-recycling system. "We'll see you in a couple weeks," Archambault radioed. No one was more eager to see Discovery take off than the three space station astronauts. Commander Mike Fincke was ecstatic when informed nothing was leaking at the pad. "That is most excellent news," Fincke told Mission Control. "That's exactly what's been on top of our minds." During Wednesday's try, hydrogen gas spewed into the air from a vent line connected to Discovery's external fuel tank. NASA replaced the hookups, but could find nothing broken. The system remained tight during the countdown, and the only problem was a pressure drop in a helium-purge system that workers quickly resolved. The only other oddity was a fruit bat on the back of Discovery's fuel tank that posed no debris threat to the shuttle and almost certainly perished. The four-day leak delay forced NASA to shorten Discovery's flight by a day and cut out a spacewalk. Because of a Russian Soyuz rocket launch March 26, Discovery needs to be gone from the space station by the time that spacecraft flies. The Soyuz will carry up a fresh crew for the space station. Discovery's mission will last 13 days and feature three spacewalks instead of four, the first of which will take place Thursday to install the new solar wings. The two wings will join six already in place and bring the orbiting outpost up to full power. The canceled spacewalk chores will be tackled by the space station crew after Discovery leaves. Mike Moses, chairman of the mission management team, estimated 80 percent to 90 percent of the mission will still be accomplished, despite the shortened flight. Discovery also will deliver a spare urine-into-drinking water converter to replace one that's broken, and a flusher and iodine solution to get rid of bacteria that's lurking in the water dispenser. NASA wants to double the size of the space station crew to six people by the end of May, and need the recycled water to drink. Discovery originally was supposed to lift off Feb. 12, but NASA ordered extra tests for the valves that control the flow of hydrogen gas into the fuel tank. The three valves in the shuttle's engine compartment kept being replaced to ensure they were the best available and safe to fly. One of these valves — which maintain tank pressure during liftoff — broke during the last shuttle launch in November. No harm was done, but NASA did not want to take any chances with Discovery. NASA said the valves seemed to work well during Sunday's liftoff. Late Sunday, Mission Control informed the astronauts that although the launch video was still being analyzed, no significant piece of debris appeared to strike the space shuttle. Two educator astronauts are aboard Discovery: Joseph Acaba and Richard Arnold II, chosen by NASA five years ago. There also is one Japanese astronaut, Koichi Wakata, who will move into the space station for at least three months, replacing one of the current crew.